Sixteen little girls and boys standing against the gable wall of a bleak schoolhouse on a high windy hill in County Carlow. The wind whips the strains of ‘O’Donnell Abu’ away from their whistles and sends the music streaming out across the plain. 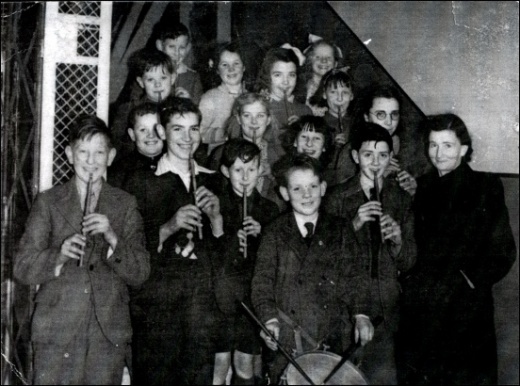 This is the Garryhill Flageolet Band, the only whistle band in the country and there’s not a whistler in it over fourteen years of age, though there’s plenty of them closer to nine. In the picture stands the only adult connected with the band. She is Mrs. Ryan, Assistant Teacher at Garryhill and wife of the Principal, and it was she who started the band six years ago. Now all Carlow is piping behind her and all Ireland listens and whistles when the Children broadcast from Radio Éireann. Soon they’ll be seeing the lights of Dublin again for their sixth broadcast. “Even a tin whistle?…” “And why not a tin whistle,” says Mrs. Ryan to herself “seeing that there’s no hope of us producing a brass band or a piper’s band or a string orchestra? So tin whistles it was. Had the inspector only known it was no trouble at all to Mrs. Ryan because, down home in Kilanerin, Wexford, when she was Cecilia Kealy, the entire Kealy family played the flageolet and had a family band. The musical Kealys played so many instruments and so well that a son is now Captain Kealy, conductor of the No. 2 Army Band in Cork. Now to whistle up the money. There were the instruments to buy, 16 flageolets and a side drum, and you can’t send the children out in miscellaneous clothes. They must have a uniform. So the people, without even a local hall to help them, got up concerts and they held them in the Ball Alley, in the open air under the evening sky and collected the cash that way. When Mrs. Ryan had bought the material, the mothers made the uniforms, each for her own child, and at local sports and concerts, where they are much in demand, the band steps out in green cap and blazer, cream skirt or trousers, carrying a green and gold banner embroidered “Foireann Cheoil, Garrdhachoille.” Two of the Ryan children are in the Band. The children grow up and leave school and alas, only too often – go away from home, but they carry their whistles with them to play now in distant places and to strange ears, for a whistle in your pocket is a great consolation against trouble and loneliness, as every whistler knows. But there are always more coming on, more young fingers for Mrs. Ryan to train. Eighty on the school roll and the other 64 dying to get on the Band.